Hey, are you still sitting there and looking at your toes, which seem far, far away? Still trying to grab your feet with outstretched fingers, day in and day out? Those feet are light years away, huh? Keep doing what're doing. Sit and reach. Sit and reach... keep wishing, that your hammies will one day get flexible. If your method has not worked up until this point, it won't work for another 10 years. Why? Because it has not worked for you and doesn't work for most people. There are a few exceptions of course. Very young athletes can get flexible, using basic stretches, so can some athletes through lots of pain and with high risk of injury. I know I couldn't, even when I was young, and this is what lead me on the journey of education in exercise physiology, library research and my own experimentation on myself and those who wanted to help and learn. Hey, but you don't care about all that. All you want to know is why my method will train you to grab your toes in short period of time and be flexible enough to put your head on your legs shortly after. You just watched a video promo. All it looks like I am doing is a bunch of stretches unrelated to the hamstring and then some weird looking pulley that pulls your legs. What the big deal? Hey I would love to stop with the whole text here and just let you get the system, do it for a few months, get very flexible and pay me once you saw that this system works and lets you bend in half like a yoga master. Unfortunately, before you decide to purchase this awesome program, you want to know how it works and why. I don't blame you; I would not want to purchase something without knowing what it is, either. Alright so here is the why, how, when, who of Hamstrings Flexibility System. My system stretches the muscles; it doesn't try to change the angles of the joints. How can I explain in differently? You see someone, standing and all of a sudden bending in half and placing their chest on their thighs. So you try to do that. All you are doing is trying to bend your hips from 180 degrees to a significantly lesser angle. Do you know how many muscles must be flexible to allow you do that? You think it's just the hamstrings, (which is 3 long muscles already), but it's not. It's a lot more. Have you heard that story of a bunch of sticks tied together not bending, but each bends when they're separated? Same here. Get to each muscle individually and you already solved 1/3 of the issue. Of course you must stretch them in the right order and the right fibers. P.S. don't make the mistake to think that you can bend the joint angle for approximate usage of that muscle and that's it. It may help very little. You have to stretch the muscles, not try to change the joint angle. That is part of the reason we use pulley system. The line of pull means a lot. Next is massage. I have thousands of students worldwide and each one uses massage to increase flexibility. No, not the 30 minutes at a local spa. The specific massage for specific muscle groups in specific order. It's not even a massage, more like a guided pressure to relax the muscles and let them lengthen. Hamstrings Flexibility System uses a variety of props for that. 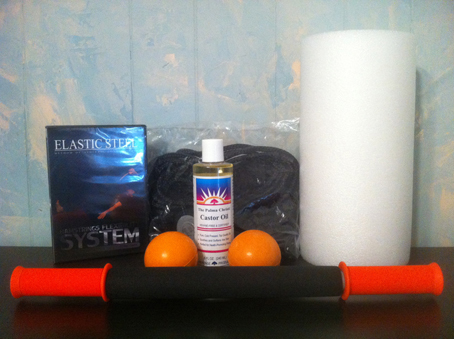 Massage stick, foam roller, massage balls. Yes, that's how important it is. What do you want to stretch? A hard inflexible cord or a relaxed pliable tissue? I prefer the second one, but you can pick. So in essence you get what you pay for. Want another DVD, where a flexible athlete spends an hour showing you how he or she gets into contortionist positions, inviting you to try the same? You can get those DVD's for 30 dollars. Hey it looks nice to see someone elbow their toes and kiss their shins, but that will not do much for you. If that stuff worked, I would not have to spend a long time researching the fastest and most effective method. And I never would have learned what I know and now ready to pass onto you. Listen if you want to finally become flexible and bend in half like you've seen those yogis, gymnasts and dancers do, but you are not ready to get my system. I totally understand. Bookmark or write down the name of this page (ElasticSteel). Go and shop around. I know you will come back later. My tracking system has been showing me this for years. You may lose some money on cheap programs that don't work. But you will lose something more important that you can never get back... TIME. Hopefully you won't get injured, with bogus cheap programs. If you do, that's OK. The massage in Hamstrings Flexibility System is also very restorative. So in essence you will just loose time and some cash, and maybe shelve space with a beautiful girl in skimpy clothes on the cover. I'm not a girl, nor do I wear skimpy clothes, but I will surely get you flexible safe and fast! So get the Hamstrings Flexibility System now, or bookmark this page for later. The decision is yours. of the package are necessary for this system to work. Just like the sport of MMA, everything is thrown into this system. Everything that works. There is absolutely no affiliation to anyone system of thought. The hamstrings flexibility system doesn't answer to Yoga, Pilates, relaxed stretches, PNF, massage therapist, any particular method of stretching or strengthening. It has been researched, revised and put together with only one goal in mind. To find out, test and comprehensively put together a System that goes around the obstacles and lets you get a good, up close and personal look at your toes, while feeling good, relaxed and in control. Let me let you in on a little secret. That little test that people do, you know sit and reach test. Is not just a test of hamstrings flexibility; It's a test of flexibility of many muscles, many of which are not even listed as hip extensors in a basic kinesiology book. All it takes is for one of those buddies to be out of whack and you can kiss reaching your toes with straight legs goodbye. Some people will have natural flexibility and strength in those muscles; some will stretch and strengthen them by chance. Do you want to rely on chance? Apparently if you have been stretching for a while now and don't see any results, CHANCE is what you have been relying on. This system is about lengthening your muscles, not trying to change the angle of your joints. In other words with the techniques I am going to each you, you are not trying to imitate a flexible person, you are training to become one. Still don't see the difference? Ok. Imagine that you have a friend who is flexible, and you are not. Your friend sits down extends his legs in front of him reaches for his toes and holds them with ease. You see this, sit down on the floor and try to reach for your toes, just like your friend just did. He is holding his toes and you are stretching your fingers forward, but nothing is happening. What are you doing? You are trying to imitate your friend. You are trying to imitate a more flexible model. Unfortunately, you don't know any better. That's what you have been taught in Elementary School, High School, in the martial arts class, in a dance class and so on. Hello! I am in my second week of the HFS. I am doing HFS exactly as described and after the first week I stopped having the pain in my hips and calf muscles.Just doing it for a week and a half, I noticed that my kicks were easier to execute and the dreaded bar at the Karate school is not so dreaded anymore. I am now able to lift my leg normally without having to swing it up there and I even lean forward a little now - all this with toes pulled back. I have stopped waking up in the middle of the night with a cramp in my calf muscle. All I can say at this point is HFS has helped tremendously. I am going to follow it just as Paul says. I guess what I am saying is this seems to work great. The second week program was an eye opener as it was hard for me to go down on one leg. I do not know how or if the hamstrings affect the hips but this has really helped. It probably should be the first thing that anyone does - then move to the kick DVD and split DVD. You will not only learn how the exercises are done; but also why these exercises will work for you. I have never been able to touch my toes but with this product I have made much closer steps to achieving my goals than ever before! The only thing to say is:- brilliant!!!!!! To climb to higher levels of skill, these tools are great! I am impressed by the thoroughness of the system. The problem is, you don't know what is going on inside his body. You only see the outside picture. There is a huge difference between a flexible person and a rigid one. Most people don't know any better, so they do the only thing they can do. They sit in those miserable stretches, day after day and never get flexible. My system is a link between where you are now in terms of flexibility and where you want to be. What I give you is not a stretch or two. I give you a total system. An average person masters this system in four months. The first month is conditioning. A fair question is why do you need conditioning, why not get into stretching? There answer is simple. My system requires your muscles to work in certain way that they haven't worked before. If you don't have strength and control, the system won't work. Without these special conditioning exercises, you may as well reach for your toes and get no results, as most people do our days. The second month is aimed at one simple goal. You trained in unilateral hamstrings flexibility. At the end of one month the goal is to sit with your foot in front of you and hold the foot, not just the toes comfortable with both hands. It's a one month program, but the goal should be achieved in three weeks. The fourth week is just maintenance. The third month is bilateral hamstrings flexibility. Sit and reach test with both legs in front of you. This is where you sit on the floor with both legs straight in front of you and hold both feet, not just toes with both hands. Fourth month takes you into additional hamstrings flexibility training to even higher level. The sky is the limit. Beside the workout, I go over how to perform the techniques unique to this system. I also explain in details how and why this system works. This system has been researched for 6 years. Revised countless number of times. Tested on a large number of diverse subjects. There is no hype. Just the most efficient system for hamstrings flexibility on the market today. The package that I'm offering for you here today includes absolutely everything that you will need to start training and get results. CLICK HERE TO GET YOUR PACKAGE TODAY!